I had a great time making video for a great Chicago Rock and Roll band. More on this band soon. Review by Emery Joe Yost Roller is a high energy rock band. If Bad Company and Lynard Skynard had a baby they would sound like Roller, with the exception of lead vocalist Rusty Bullets,who has a twinge of Bon Scott in his vocal delivery and or dna. I’m really not sure, it could be a rumor, but Rusty allegedly got his stage name when he got a tetanus infection from the strings of his rusty Flying V. I would buy their record and lookout for this hot rock outfit as they pull up their bootstraps and rock the world just like KISS. Great band! A cool bunch of guys that have a tight sound! 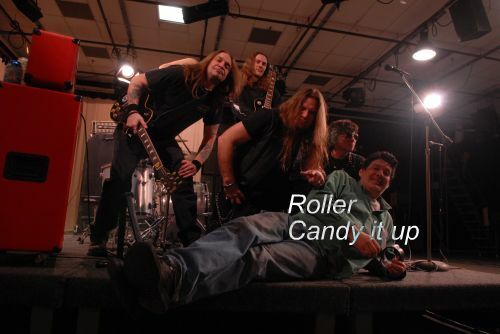 Roller is a high energy rock band. If Bad Company and Lynard Skynard had a baby they would sound like Roller, with the exception of lead vocalist Rusty Bullets,who has a twinge of Bon Scott in his vocal delivery and or dna. I’m really not sure, it could be a rumor, but Rusty allegedly got his stage name when he got a tetanus infection from the strings of his rusty Flying V. I would buy their record and lookout for this hot rock outfit as they pull up their bootstraps and rock the world just like KISS. Hey Pat, did you smoke a doob with em? Remember, party till you puke, then party some more? Huh cool guy. (Response) I do not remember, I asked if you could join the party and they said NO LOSERS. Nice bunch of rockers. Whiskey makes ya stupid. Previous PostPrevious Notable websites for Chicago Clout Fans Disabled Cops.